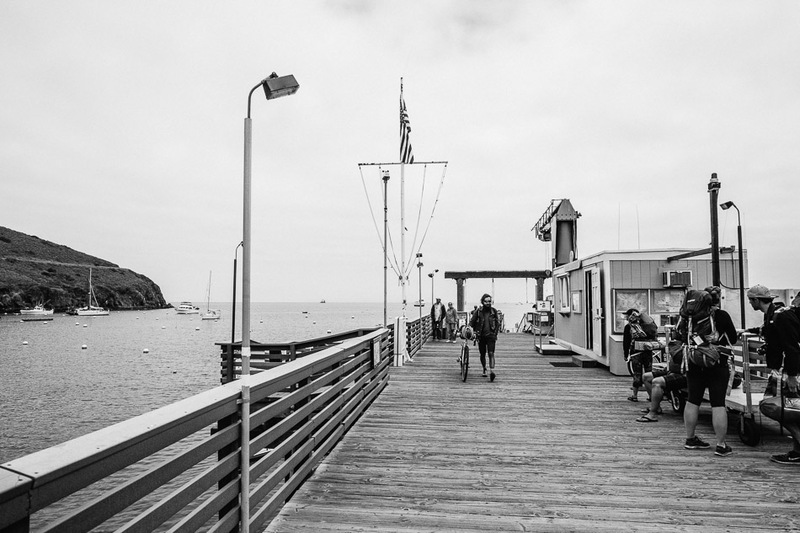 Moments after stepping on to Santa Catalina Island, I overheard two local ladies deep in discussion. “There’s mainland clean and then there’s island clean,” she said. “It’s sometimes a shock when you get to L.A. and you realize, 'oh, maybe this shirt I've been wearing for two days isn't so clean after all,'” she continued with a laugh, as she and her companion prepared to board the ferry back to the mainland. Already I was starting to understand what they meant, though I’d only been on laidback Catalina for about 30 minutes. The sun was in full glory, keeping my sunscreen in its shiniest state. My pack, weighed down with snacks and other creature comforts for our overnight adventure hung over my shoulders and fit snug around my hips to create the day’s first few drops of sweat. Thane, then Rocky Mountain Bicycles’ adventurous demo truck driver, and myself joined five others for “Unpredict Your Wednesday” on the invitation of Chris Kelly, owner of a cozy little shop just south of Malibu, Topanga Creek Outpost. Each week, the shop leads an overnight micro-adventure to a different destination either on foot or by bike. This would be our first time bikepacking, and our first time to the famous island. 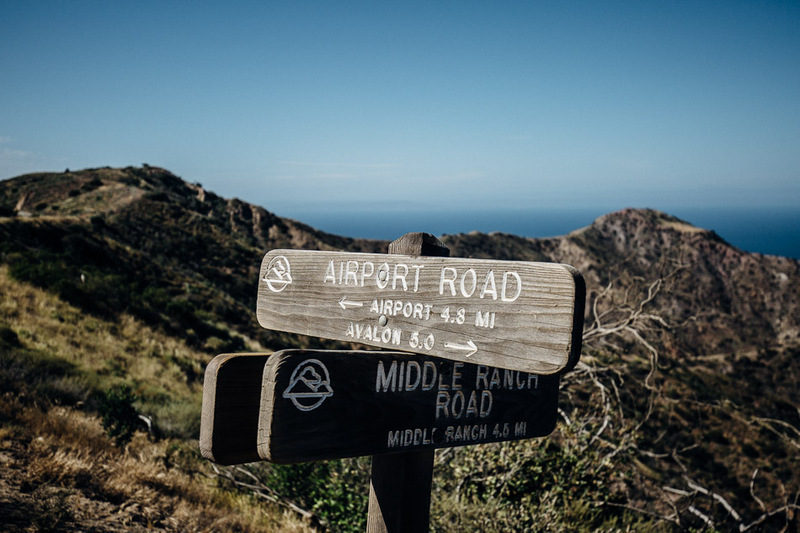 Catalina took off as a tourist destination in the 1920s when Chicago magnate William Wrigley Jr. invested millions in infrastructure–including the famous round casino–and in promoting the island. The island even became home to Chicago Cubs' training camps until 1951. There is only one incorporated town on the island, Avalon, and there is also a village, Two Harbors, at the island's isthmus–our starting point. One of the most interesting features of the dusty dirt roads that connect the two are the bison that roam freely along with you. 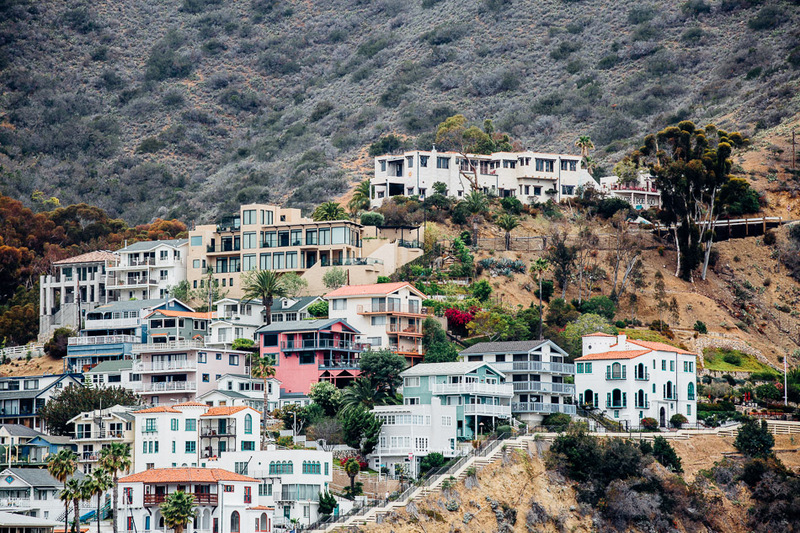 Once would-be movie stars, 14 were left behind after filming wrapped up for the 1924 film “The Vanishing American.” The movie was already over budget, and since transporting them back would have been too costly, they were marooned on Catalina. 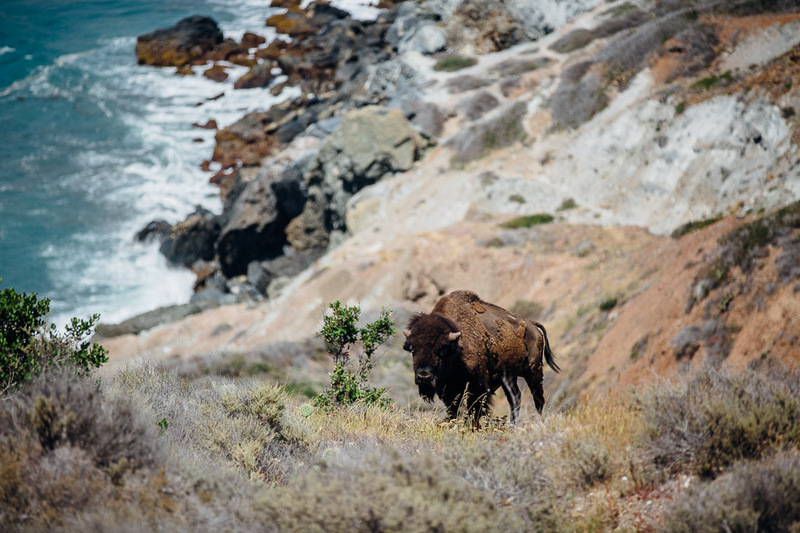 Their scenes never made it into the movie, but their fame has lived on nonetheless, and today, the Catalina Island bison herd is maintained at a population of about 150. As we began our 25-mile journey on the hill out of Two Harbors, a bison was number one on my hope-to-see list. Since there are only a few cars on the island (most residents drive around town in golf carts), our group of seven took to the dirt road with confidence we wouldn't be in any driver's way, slowly pedaling three across up our first big climb as the early afternoon sun began to beat down. At first, I couldn't shake that "last one up is a rotten egg" anxiety that I'm guessing plagues all XC racers. Strava leaderboards tempted me, even as the extra weight of the packs slowed me down. But it didn't take long for me to switch gears, and "get it." And on this day, mountain biking meant something different to me than it had before. Slower was better. A pace that let us drink in our surroundings, and chat with each other about what these huge landscapes made us feel or point out the deer, or lizards we saw along the way. I was struck by how much white noise surrounds you on the mainland–without it, the sounds of the wind, waves, birds and our wheels in the dirt took over, lulling me into the island pace. We ambled along enjoying the stark contrast of crystal-blue water against the brown dusty roads and golden meadows. The water was so blue, just looking at it seemed to satisfy a thirst. 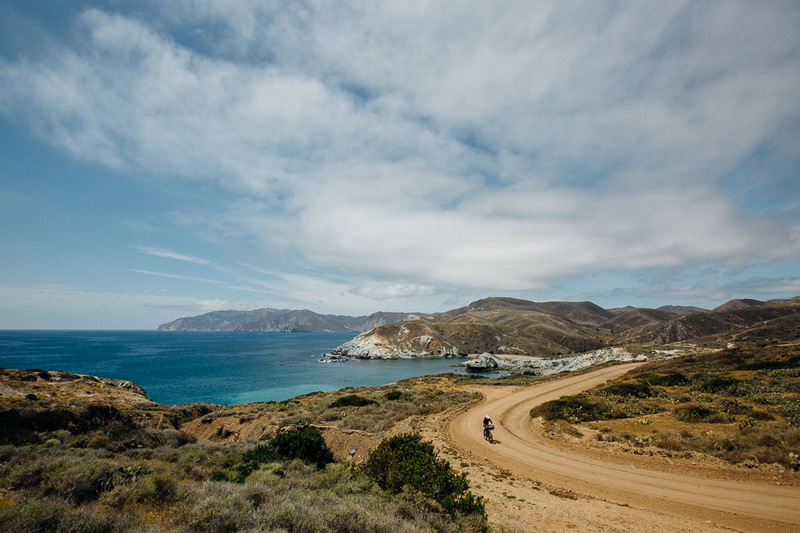 When we reached Little Harbor–an oasis of a campsite, complete with a palm tree grove, about a third of the way to Avalon–the temptation was too much and we unanimously decided this would be the place for our lunch break. The feeling of self-sufficiency is what I liked the most about bikepacking. Self-sufficiency inspires spontaneity and that's the spirit that had me in my chamois and sports bra running into the cove. We swam, took pictures of the Garibaldis we found, and then we all chose a place in the sun or shade to air-dry and have a laugh as we snacked on salami, cheese, fruits, and energy bars. A feral cat joined our group, keeping an eye on us from a short distance. I put my baggies back on over my still-wet chamois, and my sports bra quickly soaked through my jersey as well. The salt from the seawater made my skin prickly and tight as it dried in the sun. Another layer of sunscreen, and then another layer of dust completed the mix as we continued our unpredicted journey. 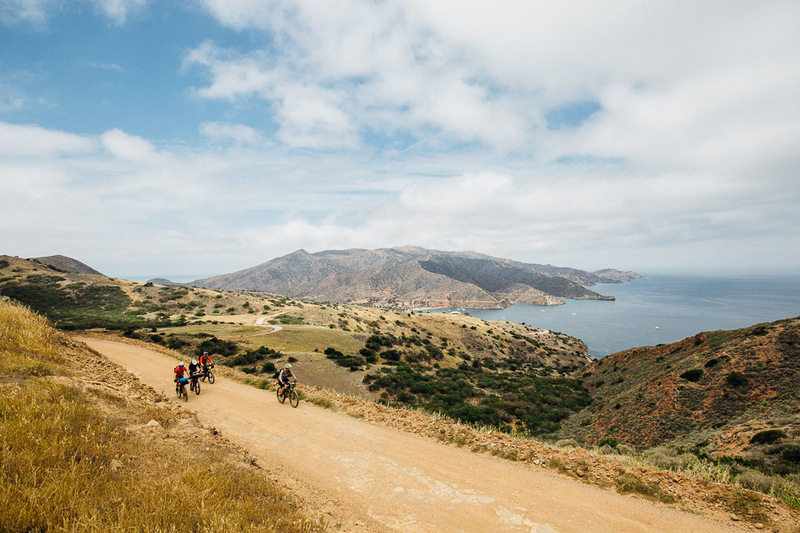 The ride was undulating, with every climb rewarded by irresistible photo ops and long descents made even more exciting by the gravity boost of our packs. We all kept repeating how incredibly beautiful this place is, in amazement that it's only an hour away from the second-biggest city in the country. With every pedal stroke, I felt the everyday worries that normally dog a Wednesday fade away. 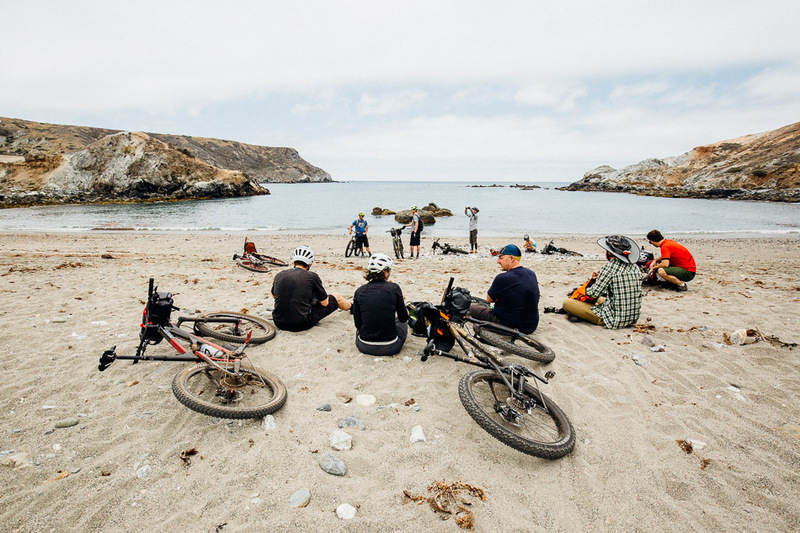 New ideas and inspirations floated into my thoughts, coupled with a growing sense of peaceful excitement about how bikepacking could become an all-new way for me to enjoy mountain biking. Just as the afternoon light was turning that California shade of golden, we spotted our first bison. Passing through Middle Ranch, a small settlement on the inside of the island, we stopped to admire a Golden Eagle at the Eagle Sanctuary there. 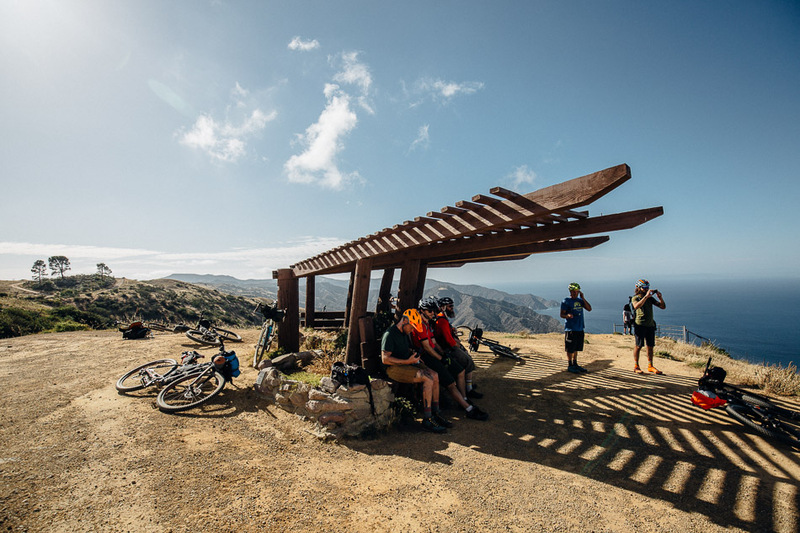 At the top of the last long climb of our day, we caught our breath at a rest stop built by Boy Scouts, perched high above the sea, just as the sun began to sink behind us. On the descent into Avalon, a buck sprang from the chaparral in front of me, startling us both. The discussion had turned from the beauty of nature and the healing sense of our journey to sore legs, beer and pizza. We arrived at the Hermit Gulch campsite in the valley just outside of town at dusk, and set up our tents and bivvys before most of our group headed into Avalon for provisions. I was eager to try out my borrowed stove and freeze-dried camp food, and I didn't think I could handle the climb back up to camp if I rolled down into town. When the rest of our crew returned, they brought s'mores, beers and other treats that we enjoyed by the light of our charcoal fire. A deer walked through our site, and a fox visited us too. I didn't last too long after my second s'more, and soon settled into my bivvy under the stars. I woke before dawn on Thursday morning. I’m not sure what disturbed me but what held me awake were the stars. I wanted to close my eyes and try for a few more minutes’ rest but I couldn’t stop staring. Shooting stars blazed across the sky. The Milky Way sparkled. Satellites blinked in and out of view. I could focus on only a few thousand of them at a time, then refocus on a few thousand more. The campsite was so quiet, I didn’t want to even rustle my sleeping bag for fear of waking the others up. Slowly, the sun’s morning rays erased each pinprick of night, and our crew began to rouse. When it couldn’t be delayed any longer, I sat up in my bag, stepped into my bike shoes and checked my hair for spiders. The same braid I’d worn all the previous day–stiffened with salt water, sweat, and dust–had held together and I covered it with my toque. My yoga pants and wool long-sleeve, which a moment ago were pajamas, were promoted to the day’s outfit. I rolled up my bed and mattress, brushed my teeth with a water bottle, loaded my bike and rolled to the docks for departure. I thought back to the ladies headed to the mainland the day before. I didn’t bring makeup or even a comb. I swam in the sea, combined that sticky salt with the sweat I worked up in the afternoon sun, and I mixed it all with sunscreen and dust kicked up by passing Jeeps and our own tires. I slept in my clothes, ate at least three things I’m allergic to (in the name of s'mores) and didn’t wash my face. 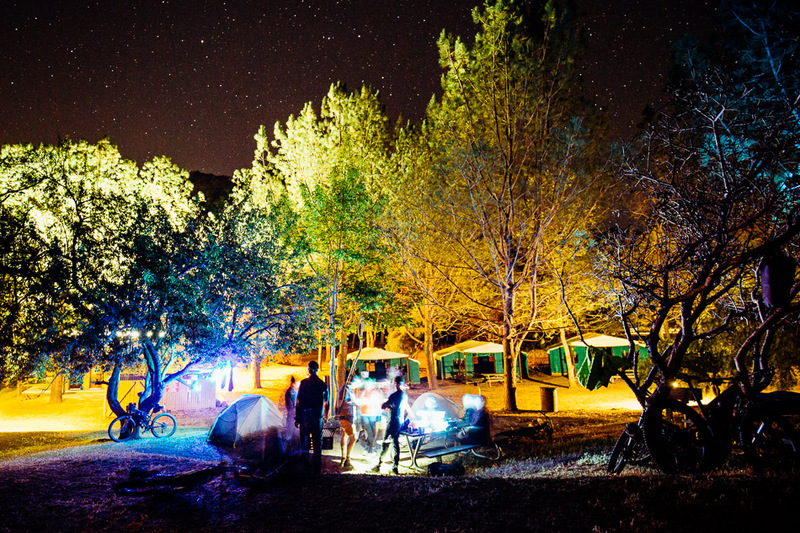 Still, in not even 24 hours, without hardly leaving home, I felt like I’d gotten away–escaped–and reconnected with nature, myself, as well as shared the experience with great new friends. I was amazed at what a person can carry and for how far, thanks to a bicycle. And also at what such an experience can overcome: stress, worry and the superficial all fade into the background. At the end of my first bikepacking trip, all I could think was that I'd never felt more cleansed. I was island clean.